Abstract: Objectives: Children with autism spectrum disorder (ASD) are more likely to develop unhealthy eating patterns and become overweight or obese. The prevention of obesity in these children is a pressing public health issue with implications for health status, independent living, and quality of life. While dietary habits are influenced by individuals’ backgrounds, food environments, and cultures, there is a lack of research investigating dietary intakes reflecting different locations or settings. 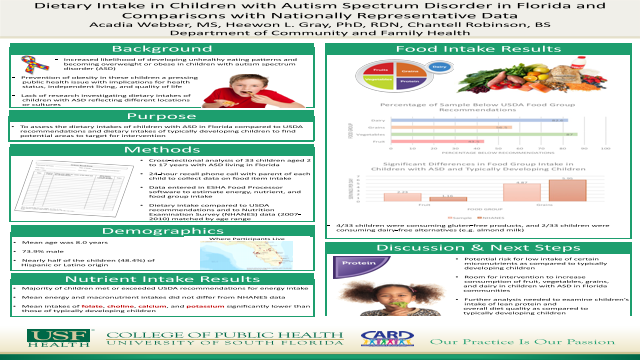 The purpose of this preliminary study is to assess the dietary intakes of children with ASD in Florida communities to find potential areas to target for intervention. Methods: A cross-sectional analysis of dietary intake of 33 children aged 2 to 17 years with ASD living in Florida was conducted. A 24-hour recall phone call was performed with a parent of each child to estimate energy, nutrient, and food item intake. Data were entered in ESHA Food Processor software, and energy, macro-, and micronutrient outcomes were generated. Food intake was categorized based on USDA recommendations and was compared to nationally representative National Health and Nutrition Examination Survey (NHANES) data (2007-2010) matched by age range. Descriptive statistics (e.g. mean, frequency, and percentage) were used, using SPSS. One-sample t-test and Chi-square test were performed to compare means and proportions, respectively. Results : The mean age was 8.02 years and 73.9% of the sample was male. The majority of children met or exceeded recommendations for energy intake, and mean energy and macronutrient intakes did not differ from the matched NHANES data. Mean intakes of folate, choline, calcium, and potassium were significantly lower than those of typically developing children (p < 0.05). The percentage of the sample below USDA MyPlate food group recommendations was 43.5% for fruit, 87.0% for vegetables, 56.5% for grains, and 82.6% for dairy. Fruit intake was significantly higher (mean 2.23 vs. 1.16 servings per day) and grain intake was lower (4.87 vs. 5.95 servings per day; 56.5% vs. 21.9% of sample below USDA recommendations) compared to typically developing children (p < 0.05). Conclusions : Findings from this preliminary study suggest that children with ASD may be at risk for low intake of certain micronutrients as compared to typically developing children. The results suggest that there is room for intervention to increase fruit, vegetables, grains, and dairy in children with ASD in Florida communities.